Design and art have a lot in common. They both involve skill, tremendous amounts of creativity and often, but not always, some element of business. Even with their differences purpose, master designers have been likened to artists in the past, and an upcoming show at the Soho Gallery for Digital Art blurs these lines even further. The Art of Apps is an exhibition that hopes to showcase the greatest user interface designers of our time, in celebration of Internet Week NY. The show, which opens on May 14th, features the likes of Danny Trinh of Path, Matias Corea of Behance, Andrew S. Allen of Paper, Mark Jardine of Tweetbot, Jon Slimak of Piictu and Andy Thompson of Cameo. We spoke with co-creators Khoi Vinh, the CEO of Mixel, Benjamin Hindman, the creator of Splash and host Peter Rojas to learn more. HW: How were the exhibiting designers chosen? How did they respond to your invitation? Vinh: We looked for the apps doing the most interesting work at the intersection of social, creativity and mobile. All of our participants hit at least two of those three criteria. However, at the end of the day, what we wanted more than anything else were apps that looked fantastic, that showcased the very best of what’s possible in the app form. All of the designers we talked to were eager to be involved; I literally didn’t have to persuade any of them to take part. I think there’s a real feeling out there that apps are becoming something of their own, something that’s becoming less and less like ‘web design’ every day. So having the chance to help crystallize that thought was very appealing to them, I’m guessing. HW: Will there be more shows like this in the future? Hindman: We certainly expect to do more of these shows. the response has been overwhelmingly positive. HW: Can you describe how the “pieces” will be presented? 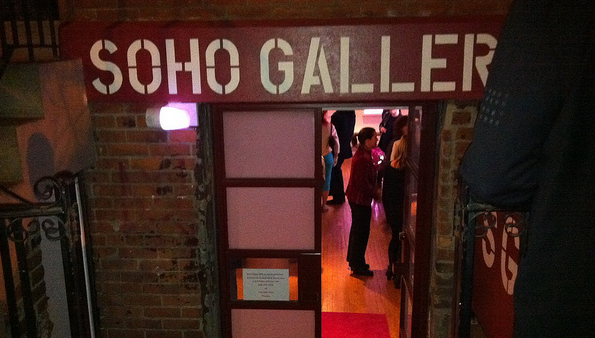 Hindman: The space, Soho Digital Art Gallery, is unique in that it is fully equipped with LED screens on the walls. The Art will be displayed on the screens. HW: What are the goals of this exhibition? Rojas: Great apps often feel complete and polished in a way that websites often don’t, something which obscures the process of experimentation, iteration, and (sometimes) failure that goes into making them. Creating an amazing user experience for an app — one where the device itself almost melts away — requires a thoughtfulness and cleverness that can be hard to find. We wanted to showcase examples of some of the smartest, best-designed apps we could find, as well as give a peek into how they get created in the first place. You can visit the show starting May 14th at 10AM in NYC. For more info, check out the link below.